I want to digitize my CD collection. 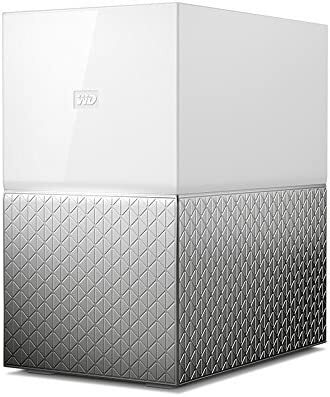 A friend recommended this: WD 8TB My Cloud Home Duo Personal Cloud Storage - Dual Drive , but the reviews were terrible Can anyone give a testimonial to the WD product or offer a similarly priced alternative? May I ask how many CDs you have? 8TB is enough storage for around 1,600,000 songs. The problem with those kind of drive is that they are RAID 0 or Striped, which means, they take two drives to make one Volume. If one of the drive dies, you loose ALL your data. So you basically double the chance of failure. They are generally faster than a single drive BUT, you run the risk of losing all your data. There are some drives that are not RAID but still 8 TB if that’s what you need. I’m not saying those will last forever, but your ods are a bit better. I’ve had drives from many company, WD, Seagate, La Cie, etc,… NONE have lasted, they ALL die eventually, so be sure you have a backup of that drive somewhere, redundancy is key. You could also look at RAID 1 solution which is basically two drives that are mirrored. So you’d get two 4TB but the space of just 4TB and not 8TB. If one drive fails, you don’t loose anything since it’s mirrored on the other drive in real time. These are generally a bit slower but for your purpose it might be good enough. Hope this helps. The drive that was recommended was a 4 x 4–one mirrors the other and is also accessible via the cloud. Regarding the size, I may partition and put all kinds of stuff on it. . .It probably is overkill. There’s also a 3 x 3 version. I’ve got a 4TB version of the previous generation to that one (the MyCloud Mirror) but I’ve not been impressed with it at all. Hopefully the new ones are better but the one I have is horrifically slow to do anything. Read / Write speeds across the network aren’t too bad but anything that involves opening the Web Management Console is soooo slow. The tools available are unintuitive, clunky and painful to use even if it was running at at acceptable speed. Not sure why but the alerting system on it that’s supposed to email out when there’s power failures / software updates or other events just seem to have stopped working. I used to sync a drive on a windows laptop to the NAS, I opted to use WD’s own sync software thinking that would have “the best compatibility” but that proved unreliable and kept falling over all by itself. Also, initially I did not setup the cloud access features as I wanted to only use it across my local network however for the sync software to work it required the cloud option turning on. Not a Scooby Doo why that was a dependancy / requirement. Combine that with recently having had a WD USB HDD fail, earning itself the dubious honour of being the only ext USB HDD ever to fail on me (unlike all the seagate ones that are still rocking away), I’ve really not been that thrilled with it or WD as a brand for that matter. Do you require a NAS type box? For my needs a NAS is the best solution as I normally use an MBP on my knee on the sofa making physically attached storage a problem. If you’ve got a iMac or Mini or something which doesn’t move then a DAS such as a Drobo or just a big USB disk permanently attached might be an option? I think the advice already offered is very good. My suggestion is that you first define whether you need a NAS or a DAS solution. If you are planning to access these ripped CDs from multiple computers or iDevices, a NAS might be the way to go. If you will predominantly using them from one desktop, a DAS will in the end be a faster and simpler solution for you. Note that if you have an always-on Mac, as many of us do, then you can also use a DAS solution and share the drive on your network. It’s less “elegant” than a dedicated NAS solution, but in many ways it is easier and cheaper to do this. If you are looking for a true NAS solution and that is really what you need, I would propose you consider something in the Synology line. It’s going to be more expensive, but also more reliable and versatile, and I have heard various reports of the WD Cloud NAS solution having some security flaws, which is also a consideration. This past week, B&H Photo had a admittedly low-end Synology 2 drive unit on sale for around $200. Yes, with the purchase of 2 drives for this unit you are spending more, but you also get a lot more for the money. If a DAS solution works for you, for example you have one main desktop mac you want the data to live on, and could work with a solution where that Mac shares the drive out to a laptop, for example, then there are a lot of ways you could go. I would consider storing all the data on a single external (USB) drive. A second identical drive could be used for a clone, made on a daily, weekly, or monthly basis depending on how often the data on the drive changes, provides you with your local backup. A solution like BackBlaze lets you put all the data in the cloud at a pretty reasonable yearly cost and attached drives (but not mounted NAS shares) will be backed up by BackBlaze as long as they are connected at least once every 30 days. If you use this drive only for storing the digitized CDs, then the data isn’t changing very often, and so you can clone the drive weekly or monthly. If you partition the drive and use it also for more actively changing data you might want another attached drive for TimeMachine and also do the clone more frequently. Another DAS solution is to use a two drive setup in RAID 1 as already discussed. RAID 1means the two drives are mirrored - the data is stored on both drives and they are identical, so if one drive fails, you have access to all your data on the remaining drive. While write speeds to RAID 1 are slightly reduced, read speads are not and since your digitized CDs are going to be primarily write-once-read-many that’s not a bad solution for you, and eliminates the need for regularly cloning the content (but not for an offsite backup). My personal solution is actually a DAS Drobo, so effectively a RAID-type solution although using Drobo’s proprietary (and hence slightly risky since if the enclosure dies you have to buy another one to put the drives into) solution. I clone daily to a second DAS Drobo, and use Arq for backups to B2, so a similar solution to what I am suggesting for you. In terms of drive manufactures, you will pretty much find someone who swears by any brand and someone who will not use the same brand due to prior drive failures. I have been using WD REDs for years with surprisingly few failures, although I have had to replace a drive on occasion in a Drobo, but I also have 4 x 4TB Seagates (pulled from on-sale Seagate USB drives and put into one for the Drobos) that have been running just fine for several years now as well. I think both are reputable brands, and when you look at the BackBlaze drive reliability data you often find that failure rates for one size of a drive are exceedingly low and yet the failure rates for a slightly different size from the same manufacturer are very high. You should assume any storage medium will fail at some point. Your protection is not to search for a drive that has a 0.1% lower failure rate; protection comes from backups both on-site and off-site. If you don’t need a NAS, stay away from it. Added complexity and always lower performance than direct attached storage (DAS) a.k.a. just plugging in a hard disk/disk system. Instead of retail brands like WD, I would strongly suggest getting a plug-in DAS from OWC/Macsales. They have a selection of chases with single drive, two drive, or more and you can buy them with or without the drives. Interface choices are USB 3x, USB-C, or Thunderbolt. https://www.akitio.com also have higher-end chassis/raid arrays that are very well respected by video editors/photographers, etc with high bandwidth/high capacity requirements. For older Macs, they can get a new lease on life by spending a little more and getting a Thunderbolt DAS drive/chassis. Older Macs have slower USB ports, but Thunderbolt, even the older “Thunderbolt 2” is very fast. Also, you don’t eat up precious USB ports - Mac mini, iMac, etc. only have a few ports. If you plug in the drive storage via Thunderbolt, you save ports which saves having to buy a dock or USB port expander to hook up other stuff like scanners, microphone, SD card readers, etc.